Wasps Ladies FC will break new ground this weekend, with a first cross-border match with an Irish club side. 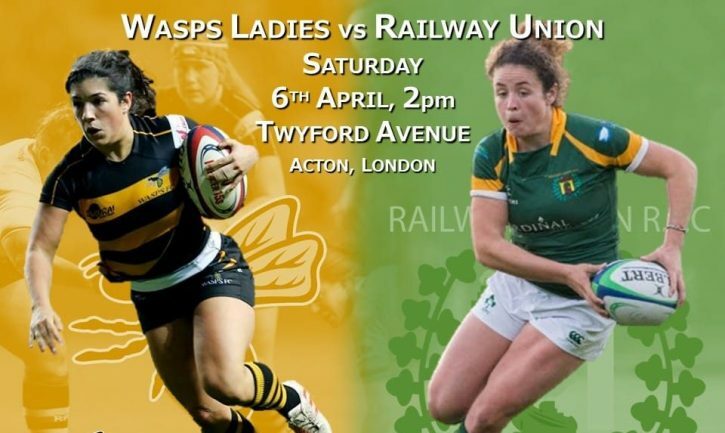 They will host Railway Union on Saturday 6th April (Kick-off: 14:00) at their home ground, Twyford Avenue. Both sides have made the semi-finals of their respective league competitions. With Wasps travelling to Allianz Park on Saturday 13th April to face Saracens, and Railway Union going to Old Belvedere on the same day. Railway Union RFC are a consistently stronger performer in the All-Ireland League, finishing in the top four places for the past four years in a row. They also contributed five players to Ireland’s Six Nations squad, including prop Lindsay Peat and lock Aoife McDermott. The Irish side have already tasted success this season, having won the All-Ireland Plate, against their semi-final opponents, Old Belvedere, last weekend, 25-8. What kind of style of rugby can we expect from Railway Union at the weekend? “Funnily enough I reckon the teams aren’t that different in their make up or style of play. Both Wasps and Railway love to play free flowing rugby, moving their mobile pack around the park, interlinking backs and forwards frequently. Having experienced both Premier 15s competition and All-Ireland League, what are some of the main similarities and differences between the two leagues? Do you have particularly enjoyable memories or matches from your time with Railway Union? Are there any particular players we should be on the look out for this weekend at Twyford Avenue from your old side? How important is this fixture in maintaining the momentum after positive results and performances against Gloucester-Hartpury and Bristol since the Six Nations? “It’s huge, while it is a very long season for some of the girls who were involved in 6 Nations campaigns and Autumn internationals, there are a lot more of us who need as much game time as we can get our hands on at the minute, and to have that opportunity again this weekend is fantastic! 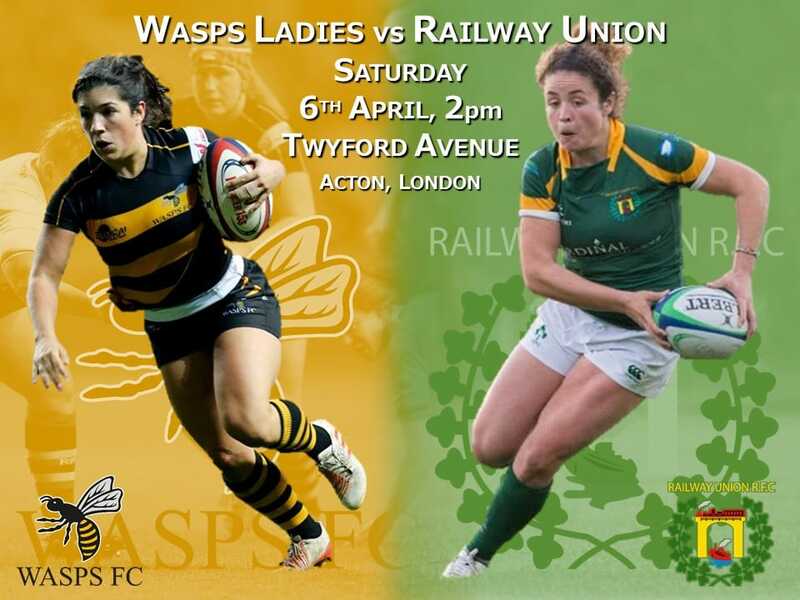 The historic fixture takes place Saturday 6th April at Twyford Avenue, Acton, kicking off at 2pm. Come down and support the sides and enjoy, what is sure to be, an exciting encounter between two of the top club sides in their countries. Investec Women’s Hockey League reports and results, 7 April 2019. The Six Nations – After the Lord Mayor’s Show?. England’s best win Polish Open title. Investec Women’s Finals Weekend – Championship Play-Offs. Brtistol Ladies Rugby looking for new Backs Coach. Yeovil Town get off the mark with 3-0 win over Oxford United. SSE Women’s FA Cup Final is almost upon us. 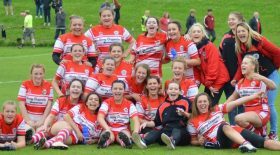 Featherstone Lionesses crown 1st season with Challenge Cup win. World Cup Fever hits Brighton. Four golds among dynamic dozen medals for University of Bath-based swimmers. Abigail Byrne announced as SSE Women’s FA Cup Final referee. Derby delight followed by Saracens setback for Team Bath Netball. Vitality Netball World Cup 2019 signs unique partnership agreement with Rugby League World Cup 2021. 7s Contracts are we on the right track?. Canada win HSBC Kitakyushu Sevens with last-gasp try. England Women Sevens win silver at HSBC Kitakyushu Sevens.